Dorman Wheel Bearing Hub Assembly 00-01 Ram 1500 4WD 4WH ABS Dorman Wheel Bearing Hub Assembly 00-01 Ram 1500 4WD 4WH ABS, Wheel Bearing Hub Assembly 00-01 Ram 1500 4WD 4WH ABS, Wheel Bearing Hub 00-01 Ram 1500 4WD 4WH ABS, Wheel Bearing Hub 00-01 Ram 1500 4WD, Wheel Bearing Hub Dodge Ram 1500 4WD 4WH ABS, [Dorman 4110424 Wheel Hub] - $129.99 : 3rd Strike Performance, Your Source for Late Model MOPAR Performance Parts and Accessories! Dorman wheel hubs are built with an industry-leading evaluation process that ensures their hubs are designed for long-lasting reliability and performance. Plus their vehicle try-on testing ensures a proper fit, every time. They feature sturdy steel construction. Bearings press onto the hubs for ease of installation. Wheel hubs are an integral component of your wheel assembly, crucial to establishing the handling characteristics of your vehicle. 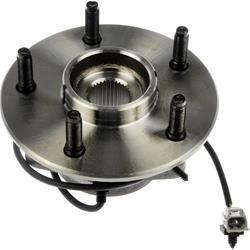 Trust Dorman hubs to deliver the best performance.